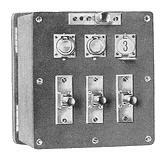 This switchboard is suitable for small installations where the lines are short and of low resistance, and may be used for either earth or metallic circuits. The woodwork is matt polished and the front face is covered with fibre. The indicators are the hand-restored drop type with alarm contacts, and they act for calling and clearing. An alarm switch is provided, but a separate bell and battery must be installed if an audible signal is desired when an extension instrument is calling. To operate the switchboard a separate telephone is required. Overall dimensions 6.35 x 6 x 6 inches.